The optimum timing for your 100% Whey Plus shake is within 30 minutes of completing a workout, in a carbohydrate source (milk, coconut water, Replace Sports Drink, low acid fruit juice). You can also have a shake 90 minutes prior to a workout (made in water), or have one as a mid morning/mid afternoon snack. For trainers with high metabolic demands, 100% Whey Plus should also be taken just prior to bedtime to give your body amino acids to use for muscle repair and growth while you sleep (not recommended before bed if your goal is the manage weight). 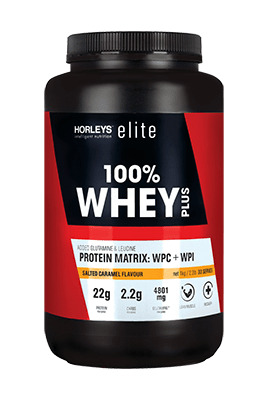 100% Whey Plus is a perfect protein fortifier for other foods too: add it to cereals, yoghurt and fruit smoothies. For weight management 100% Whey Plus is best within 60 minutes of completing a workout to support muscle repair and recovery. It can also be used as a filling mid-afternoon snack replacement, or as an occasional meal replacement (as part of a balanced diet incorporating whole foods). Whey Protein Matrix (93.9% (Whey Protein Concentrate, Whey Protein Isolate)), Amino Acid Complex (L-Glutamine, L-Leucine), Thickeners (415, 466), Flavours, Sweetener (955). The proprietary double-protein blend of Horleys Elite 100% Whey Plus is designed to offer the benefits of a full spectrum protein (all the essential amino acids your body needs plus beneficial bioactive components that support immune health, provide anti-viral properties and more). You get a precise ratio of amino acids from two superior protein sources: ultrafiltered whey protein concentrate and micro-filtered cross flow whey protein isolate. Thanks to the inclusion of high Glycomacropeptide (GMP), immunoglobulin and lactoferrin containing whey protein (from WPI and WPC), 100% Whey Plus does more than just stimulate growth hormone release and muscle synthesis. Specific unique bioactive whey fractions* have roles in improving immune function and gastrointestinal health, and have been shown to exhibit anti-viral and anti-microbial activity as well as boosting cardiovascular health and bone mineral density. Boosted with additional Leucine, the key branch chain amino acid involved in muscle synthesis, and Glutamine, which aids in the prevention of muscle breakdown, supports reduction of body fat and increases lean body mass. *Check out this article for more info on Protein for Sports Nutrition, which covers some of the technical terminology in more detail. BEST FOR: Supporting gym-goers and sports-people with regular fitness and exercise programmes, for muscle recovery and lean muscle mass maintenance. Plus off-season bodybuilding muscle mass maintenance, and weight management diets that include high protein and moderate carbs. Pure whey protein isolate (WPI) and whey protein concentrate (WPC) are both rapidly digested for accelerated recovery and lean muscle gain. Supplemented with glutamine to aid in the prevention of muscle breakdown as well as support reduction of body fat and increase lean muscle mass. Leucine is the primary BCAA that contributes to muscle building. It's the amino acid that switches on the body's ability to build lean muscle. 100% Whey Plus has a complete amino acid profile, so it's great for rebuilding muscle and providiing vital nutrition for the body. Amino acids are the building blocks of protein, and the BCAAs (branch chain amino acids) are the three key amino acids that are anabolic to promote muscle growth, and anti-catabolic to prevent muscle breakdown.